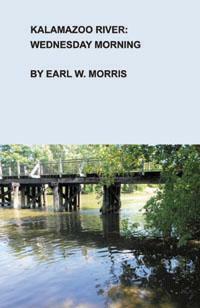 Kalamazoo River is the third novel in Earl Morris' trilogy "Michigan: Water Wonderland." Thomas Morgan, a retired professor, along with his loyal helpers spent years of investigation of cold cases involving sexual abuse. One Wednesday morning, Simone Pike the mentally disturbed wife of an evangelical minister was abused, tortured, and abandoned on the banks of the river by a survivalist militia group. She had married into the family of an early pioneer in the village of Wabaunsea who had gained a huge fortune from a furniture factory, a mysterious gold mine, and other enterprises. The controversial distribution of the fortune that by 2010 was in the multi-millions serves as the backdrop behind the story. The denouement hinges on the discussion among Morgan and his associates why sexual abuse continues as the main focus of Morgan's post-retirement work. Morgan's revelation that he was abused as a child silences his associates.